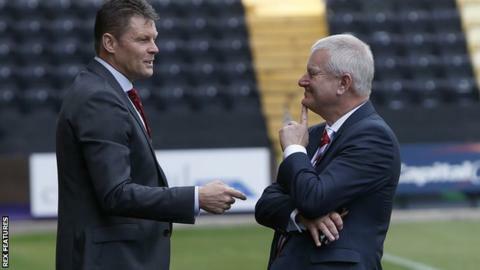 Bristol City owner Steve Lansdown has given his backing to manager Steve Cotterill despite their position near the Championship relegation zone. City are 20th and just two points above the bottom three, having won only four league games this season. However, Lansdown says Cotterill's job at Ashton Gate is not under threat. "He is the man at the helm to take us forward," Lansdown told BBC Radio Bristol. "The club moves forward and Steve has done a great job." Lansdown, who was speaking before Saturday's 1-1 draw with QPR, appointed Cotterill in December 2013 and the club have since won the League One title and Johnstone's Paint Trophy. "If you look back at what the club has achieved, his record speaks for itself," added Lansdown. "A manager at this football club gets the full support of me, the board and hopefully the supporters. "Let's face it, we are not in a great position but we are not adrift, there are plenty of positives and I don't have those negative thoughts." City's owner says he hopes if they can remain in the Championship this season they can strengthen significantly in the summer to challenge near the top of the Championship next term. He believes the completion of redevelopment at Ashton Gate will give them extra financial clout, while they will also hope to avoid errors made in the transfer market this summer. "We went for players that weren't going to come to Ashton Gate," he said. "They wanted to be in the Premier League or at clubs challenging at the top of the Championship. We wasted a bit of time on those players if we're honest. "Up until this season Ashton Gate hasn't been able to generate the revenue to allow us to compete in the division. "With 27,000 capacity and good corporate facilities and better sponsorship opportunities, that gives us much bigger backing."